Translohr vehicles are now providing tram-like service in Clermont-Ferrand. Translohr is a rubber-tired tramway (or guided bus) system, originally developed by Lohr Industrie of France and now run by a consortium of Alstom Transport and Fonds stratégique d'investissement (FSI) as newTL, which took over from Lohr in 2012. It is used in Paris and Clermont-Ferrand, France, Medellín, Colombia, Tianjin and Shanghai, China, and Venice-Mestre and Padua in Italy. In June 2012, Alstom Group and the Strategic Investment Fund acquired Translohr for €35 million. The Translohr system is intended to provide a tram or light rail-like experience compared to regular buses or trolleybuses. Unlike other guided bus systems (including the similar but incompatible Guided Light Transit system developed by Bombardier Transportation), Translohr cars are permanently fixed to guide rails, and cannot divert from them, similar to traditional steel-wheeled rail vehicles. Since the guide rail automatically guides the vehicle along its route, there are minimal steering controls in the driver's cab. Accelerating and braking are the only functions the driver controls. Like a conventional tram, power is provided by overhead wires and collected with a pantograph. The vehicle can also be run on internal batteries (arranged in packs) on sections of the route without overhead wires. There are two main designs for the vehicles: the bi-directional STE series, and the unidirectional SP Prime series. They consist of three to six articulated sections like a conventional tram, with a length from 25 to 46 metres (82 ft 1⁄4 in to 150 ft 11 in) long and 2.2 metres (7 ft 2 5⁄8 in) wide. Their net weight is 23–44 tonnes (22.6–43.3 long tons; 25.4–48.5 short tons), depending upon the number of car sections. Translohr LRVs cannot run without a guide rail since they are not classified as buses. Hence, vehicles that are used on the Clermont-Ferrand network do not have license plates. The Translohr system is more expensive than conventional trams or light rail systems, with higher building and operating costs. The 14 km (8.7 mi) Châtillon–Viroflay Line in Paris cost 27.4 million euros per km, including infrastructure, improvements of the right-of-way, and the purchase of 28 STE6 vehicles. In addition, due to the tyres constantly running over the same area of road, there is significant erosion of the roadway; this has already happened with Bombardier Guided Light Transit transit system, resulting in extensive repairs at significant cost to the operator. This adds to already high running costs. Ride quality is also said to be poor and is not much of an improvement over a standard bus due to the four-wheeled design, whereas trams have trucks (bogies) with shock absorbers or springs. The Translohr system has also suffered some derailments. The Tianjin system suffered a derailment on 20 August 2007, three months after its inauguration. There were five derailments on Padua's new installation in 2007 before its inauguration, and one on 22 April 2010 due to a misaligned switch. Critics of the system also point out that, unlike a conventional tramway, Translohr is a proprietary system, meaning that once it is installed, a city would face difficulties in buying vehicles from any manufacturer other than Lohr Industrie. 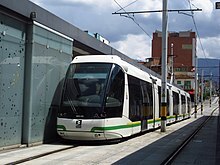 A standard tramway, on the other hand, can easily accommodate vehicles from multiple suppliers; Strasbourg, for example, chose the Citadis tram from Alstom in 2005 to supplement its existing Bombardier Eurotram fleet. ^ "Alstom et le FSI rachètent Translohr pour 35 millions d'euros". Le Monde.fr (in French). 11 June 2012. ISSN 1950-6244. Retrieved 21 November 2017. ^ "国内首条现代导轨电车出轨 (lit. the first modern guided tram in China derails". QQ.com. ^ a b ""Guided-bus" ("BRT") plagued by derailments". Light Rail Now! Newslog. Light Rail Now! Project. 13 May 2007. Wikimedia Commons has media related to Translohr. Hondius, Harry: Translohr – Straßenbahn auf Gummireifen: Stand der Entwicklung. Stadtverkehr 5/2015, p. 8–12. This page was last edited on 27 February 2019, at 18:43 (UTC).